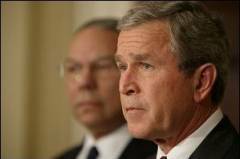 (February 6, 2003) -- Warning that an Iraqi-designed, biologically-armed weapon of mass destruction could, if launched from a ship off the U.S. coast, threaten areas hundreds of miles inland, President George delivered his most forceful statement on the Iraqi regime to date. In blunt and extremely strong terms, the President charged Baghdad's leaders at the highest level had conspired to deceive U.N. weapons inspectors and flout a unanimous U.N. Security Council resolution to rid the country of weapons of mass destruction. All the world has now seen the footage of an Iraqi Mirage aircraft with a fuel tank modified to spray biological agents over wide areas. Iraq has developed spray devices that could be used on unmanned aerial vehicles with ranges far beyond what is permitted by the Security Council. A UAV launched from a vessel off the American coast could reach hundreds of miles inland. One of the greatest dangers we face is that weapons of mass destruction might be passed to terrorists, who would not hesitate to use those weapons. Saddam Hussein has longstanding, direct and continuing ties to terrorist networks. Senior members of Iraqi intelligence and al Qaeda have met at least eight times since the early 1990s. Iraq has sent bomb-making and document forgery experts to work with al Qaeda. Iraq has also provided al Qaeda with chemical and biological weapons training. On September the 11th, 2001, the American people saw what terrorists could do, by turning four airplanes into weapons. We will not wait to see what terrorists or terrorist states could do with chemical, biological, radiological or nuclear weapons. Saddam Hussein can now be expected to begin another round of empty concessions, transparently false denials. No doubt, he will play a last-minute game of deception. The game is over. All the world can rise to this moment. The community of free nations can show that it is strong and confident and determined to keep the peace. The United Nations can renew its purpose and be a source of stability and security in the world. The Security Council can affirm that it is able and prepared to meet future challenges and other dangers. And we can give the Iraqi people their chance to live in freedom and choose their own government. Saddam Hussein has made Iraq into a prison, a poison factory, and a torture chamber for patriots and dissidents. Saddam Hussein has the motive and the means and the recklessness and the hatred to threaten the American people. Saddam Hussein will be stopped. The Secretary of State has now briefed the United Nations Security Council on Iraq's illegal weapons programs, its attempts to hide those weapons, and its links to terrorist groups. I want to thank Secretary Powell for his careful and powerful presentation of the facts. The information in the Secretary's briefing and other information in our possession was obtained through great skill, and often at personal risk. Uncovering secret information in a totalitarian society is one of the most difficult intelligence challenges. Those who accept that challenge, both in our intelligence services and in those of our friends and allies, perform a great service to all free nations. And I'm grateful for their good work. The Iraqi regime's violations of Security Council resolutions are evident, and they continue to this hour. The regime has never accounted for a vast arsenal of deadly biological and chemical weapons. To the contrary; the regime is pursuing an elaborate campaign to conceal its weapons materiels, and to hide or intimidate key experts and scientists, all in direct defiance of Security Council 1441. This deception is directed from the highest levels of the Iraqi regime, including Saddam Hussein, his son, the Vice President, and the very official responsible for cooperating with inspectors. In intercepted conversations, we have heard orders to conceal materiels from the U.N. inspectors. And we have seen through satellite images concealment activity at close to 30 sites, including movement of equipment before inspectors arrive. The Iraqi regime has actively and secretly attempted to obtain equipment needed to produce chemical, biological and nuclear weapons. Firsthand witnesses have informed us that Iraq has at least seven mobile factories for the production of biological agents, equipment mounted on trucks and rails to evade discovery. Using these factories, Iraq could produce within just months hundreds of pounds of biological poisons. The Iraqi regime has acquired and tested the means to deliver weapons of mass destruction. All the world has now seen the footage of an Iraqi Mirage aircraft with a fuel tank modified to spray biological agents over wide areas. Iraq has developed spray devices that could be used on unmanned aerial vehicles with ranges far beyond what is permitted by the Security Council. A UAV launched from a vessel off the American coast could reach hundreds of miles inland. Iraq has never accounted for thousands of bombs and shells capable of delivering chemical weapons. The regime is actively pursuing components for prohibited ballistic missiles. And we have sources that tell us that Saddam Hussein recently authorized Iraqi field commanders to use chemical weapons -- the very weapons the dictator tells the world he does not have. We also know that Iraq is harboring a terrorist network, headed by a senior al Qaeda terrorist planner. The network runs a poison and explosive training center in northeast Iraq, and many of its leaders are known to be in Baghdad. The head of this network traveled to Baghdad for medical treatment and stayed for months. Nearly two dozen associates joined him there and have been operating in Baghdad for more than eight months. The same terrorist network operating out of Iraq is responsible for the murder, the recent murder, of an American citizen, an American diplomat, Laurence Foley. The same network has plotted terrorism against France, Spain, Italy, Germany, the Republic of Georgia, and Russia, and was caught producing poisons in London. The danger Saddam Hussein poses reaches across the world. This is the situation as we find it. Twelve years after Saddam Hussein agreed to disarm, and 90 days after the Security Council passed Resolution 1441 by a unanimous vote, Saddam Hussein was required to make a full declaration of his weapons programs. He has not done so. Saddam Hussein was required to fully cooperate in the disarmament of his regime; he has not done so. Saddam Hussein was given a final chance; he is throwing that chance away. The dictator of Iraq is making his choice. Now the nations of the Security Council must make their own. On November 8th, by demanding the immediate disarmament of Iraq, the United Nations Security Council spoke with clarity and authority. Now the Security Council will show whether its words have any meaning. Having made its demands, the Security Council must not back down, when those demands are defied and mocked by a dictator.